I got back from the Lake District at the start of the week. Before I went the forecast really hadn’t been too promising – a series of low pressure systems rolling in from the Atlantic – but for various reasons I’d only made one trip up there this year, so I was really missing the place. In any case, early November is often the ideal time for autumn colours, and I also wanted to get to a vintage sports car rally I’d photographed last year at the top of the Honister Pass. The rally was on the Saturday and luckily there was no repetition of the freezing rain and driving snow that almost broke my spirit, but I still got a good soaking just when I thought the weather was going to be kind. That was pretty typical of the two weeks. Of course, Lake District weather is famous notorious for its bewildering changeability. You do get spells like this September when high pressure dominates and I had two weeks of morning mist, still water and not a single drop of rain. Or you can get last Christmas when the downpours barely ceased. But usually you just get change, and as the saying goes, if you don’t like the weather now, just give it another ten minutes – it’ll be worse. Or it could be better. You just never know. This time though, it wasn’t really changeable – a better word is “capricious”. This place, Dalt’s quarry, isn’t far from where I stay but I’d only seen it for the first time in September. That day, this scene was very green, but it looked like an autumn location and I made a mental note to return in November. On the first day I went, the forecast had been grey but dry – yet it was pouring down by the time I got there. My walking gear is fine, my camera gear is well-protected, and I believe there’s no such thing as bad weather, just different light – but the photos just weren’t up to much. So when I tried again later that week, I’d only been walking for 5 minutes when the clouds parted and wasn’t going to repeat the same walk in the rain and the same rotten pictures – not when I could turn back and go for a pint instead! I’d more-or-less decided that fate was against me and Dalt Quarry. On the final morning of the trip though, I had so-nearly decided to set off and drive straight down to London when a bit of sun made me give Dalt’s one last go. And that’s what you see here. 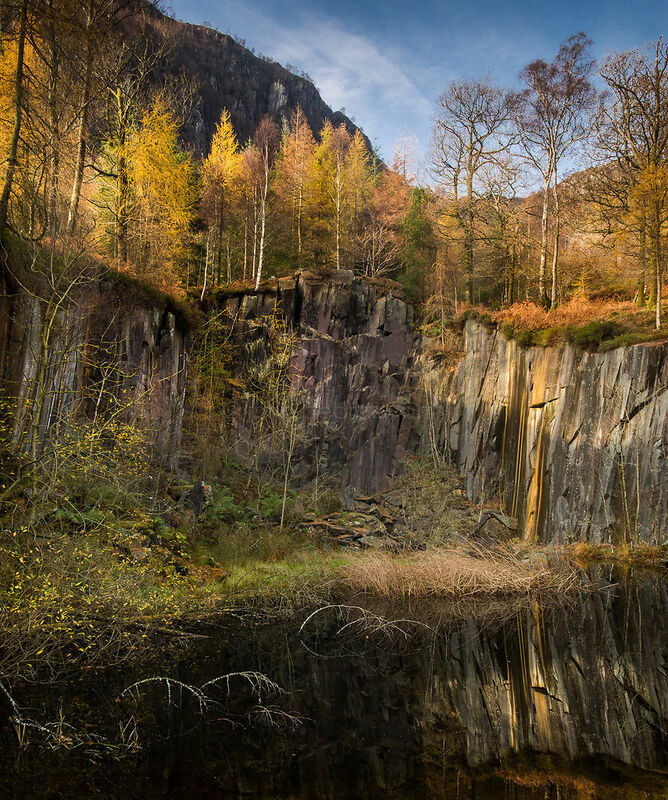 The cloud had cleared by the time I reached the quarry, the sun was nicely at an angle behind the trees and falling on the famous yellow streak, the air was still and the reflections perfect – and I had the place entirely to myself. It’s a 0.6 second exposure at f22 on the Nikon D800, with a Lee 3 stop soft graduated filter holding back the sky. Fate did eventually intervene, though in a different if not unexpected way. I’m pretty good at not dropping photo gear or getting stuff wet, but there is one big exception – cable releases. Since I first picked up a camera, I consistently need a new one every couple of years, almost always because of moving around with the cable release attached to the camera and it dropping off somewhere. So it’s totally my own fault, and I’m pretty inured to the thought of giving Nikon £50-70 for a replacement every other year. This time was only unusual in that the cable got caught under my size 12 boot as I clambered up the left side of the quarry – as I pushed myself up a steep bit I tore it apart. Here we go again…. Anyway, this time my £70 hasn’t gone to Nikon. I did look at their fancier £130 release because it does something that really belongs in every high end camera – it lets you set manual shutter speeds longer than 30 seconds. Camranger is great, but it’s more than a replacement for a cable release, while I had seen Triggertrap being used by Richard Leishman when we shared Brandelhow jetty one morning, but it required a smartphone and mine remains in the stone age. So instead I went for the Hahnel GigaPro II wireless remote control. It’s small, worked first time, works when I’m half way up the street and the camera is behind a glass window – and it cost no more than a simple Nikon cable. So after two good soakings, sometimes fate does work to your advantage.